The OSK I has a massive blade that is much longer than the handle and the hand that holds it. The blade has an unusual shape as well. It has a curve for work like removing bark and a blunt spine that can be hammered on to apply extra force. The handle spine extends in a straight line to the point, allowing the knife to be used as a spear when attached to an appropriate shaft. A projecting ricasso keeps the fingers from sliding forward on the knife. The blade, made of 440 SS stainless steel with a black protective coating, has an integral design for greater stability: it extends all the way from the point to the lanyard hole at the rear. 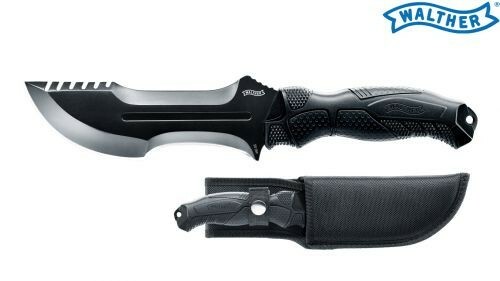 The polymer handle has slip-resistant rubber inlays. When not in use, the OSK I is protected by a nylon sheath with a synthetic inlet. The sheath has one long loop and four narrow transverse loops for the belt.